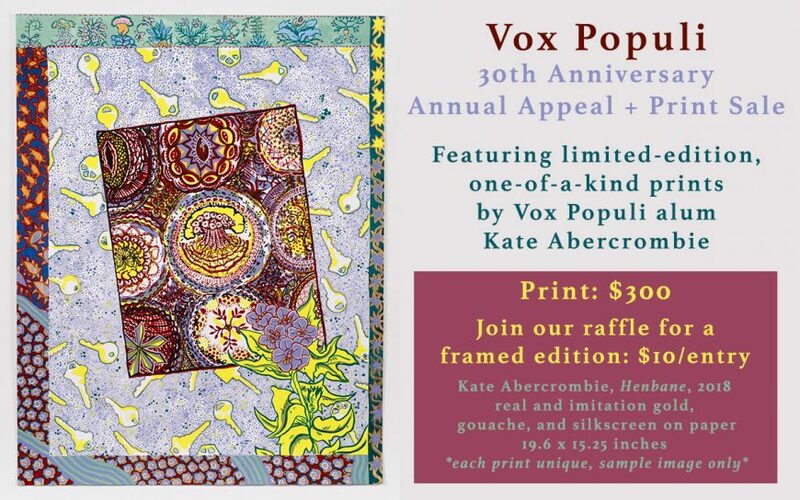 Receive a 30th Anniversary Vox Populi Tote-Bag. Please note: donating $25 does not automatically enter you into our raffle. Receive a limited-edition T-shirt by Vox Populi Alum Tristin Lowe sporting an image of his unforgettable 2016 installation Transmutation: Into the Wind, featuring half of a Volkswagen Passat suspended from our ceiling! Invitation to a studio-tour and cocktail reception (date TBD) at the Philadelphia home and art studio of Vox Board Member and acclaimed painter Sarah McEneaney. On March 1, 2019, join Vox Populi Executive Director Danny Orendorff for lunch with Jodi Throckmorton, Curator of Contemporary Art at the Pennsylvania Academy of the Fine Arts, who will then lead a private tour of her exhibition Rina Banerjee: Make Me A Summary of the World. Host a fully-staffed event (beer/wine bar + bartender, event-runner) in our 1000sq. ft. Black Box performing arts space! Perfect for birthday and dance parties! Good for one 6-hour event (including set-up/break-down) and subject to availability. * The winner of our framed Kate Abercrombie print edition will be drawn and announced during January 2019’s First Friday opening reception on Friday, January 11, 2019. NOTE: Those contributing $50 or more receive the rewards associated with smaller donations, including three raffle-ticket entries into the Kate Abercrombie print drawing but excluding the print itself. Print offered separately. For 30 years now, Vox Populi has presented original, thought-provoking and experimental exhibitions and programs that have challenged and expanded our concepts of what art can be or do. Artist-ran organizations like ours are so essential to the free flow of new ideas, forms, collaborations and organizational strategies amongst creative independents. Our artists, organizers and curators continue to achieve unexpected creative breakthroughs, create meaningful community connections and provide truly transformational moments of discovery. This results in a broader, richer, more eclectic and inclusive culture. Joining the organization this past year, I am overwhelmed by the abundance of energy, creativity and ambition amongst the current membership, who sustain and fortify our organization with their generosity, art and ideas. I remain amazed by my first time at one of Vox Populi’s legendary First Friday gallery openings; still in awe of the hundreds of Philadelphians (and those visiting) who find inspiration and community within our space. We are so grateful to Vox alum Kate Abercrombie for working with us on one-of-a-kind, limited edition prints as part of this year’s appeal! Preview Kate’s print, here! Your support of our organization allows us to continue to provide that space, both to our artists and to our audiences. Your contributions mean the world to us, while also making it possible. Ps. I hope you can join us for our 30th Anniversary Holiday Party + Fundraiser on Friday, December 14 from 8-11pm at Vox! Kate Abercrombie creates gouache-on-board paintings that incorporate a wide array of images scavenged from mediated visual culture as well as depictions of objects she lives with subverting our expectations regarding medium, style, period, and technique. Her work references Cubism, Futurism, and American Precisionism as well as earlier historical predecessors—trompe l’oeil artists such as John Peto and William Harnett. 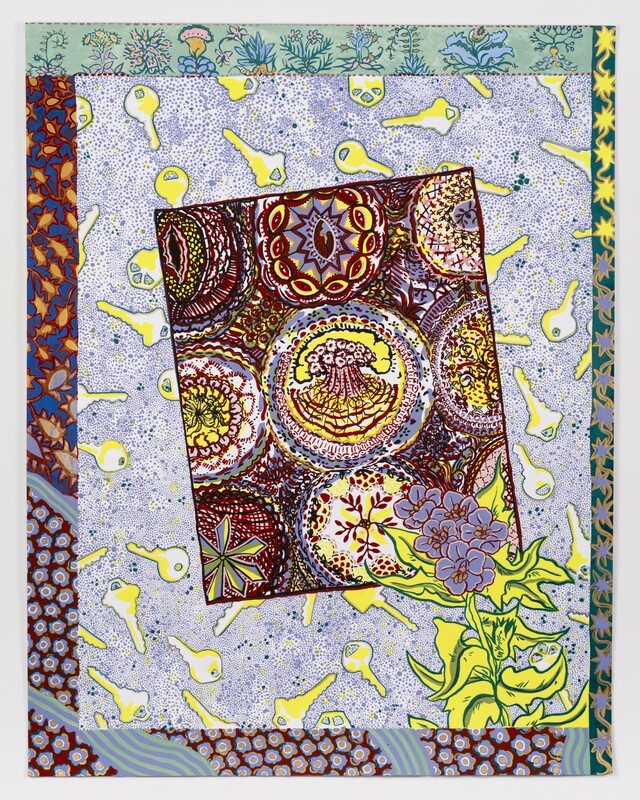 On March 1, 2019, join Vox Populi Executive Director Danny Orendorff for lunch with Jodi Throckmorton, Curator of Contemporary Art at the Pennsylvania Academy of the Fine Arts, who will then lead a private tour of her exhibition Rina Banerjeee: Make Me A Summary of the World. * The winner of our framed Kate Abercrombie print edition will be drawn and announced during January 2019's First Friday opening reception on Friday, January 11, 2019.